Yumi Tamura has a knack for doing something different. Her shojo/action/romance/drama/shonen-ai blockbuster, Chicago, was as enjoyable as it was hard to categorize. One book into Basara, not only do I get the same feeling of refreshing originality emanating from the work, but it seems to possess even greater depth to the world and characters than her other domestically available release. 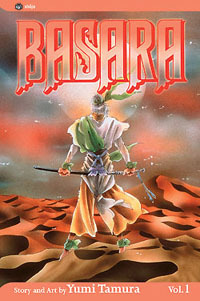 Touted by Viz as "one of the most popular shojo manga of the 90s," I can easily see how Basara earned that claim. While this is a fantasy (or perhaps science fiction) story, the realism with which it is presented makes it more of an alternate future than a far-off fairy tale. This is not escapist storytelling, but rather a prophetic vision of a destiny that may await mankind. Basara is a fictional story set in a real location (albeit one that has been modified by Yumi Tamura's imagination) brought to life by real characters. With all of the new releases from Viz, there really wasn't anything in particular about this manga that nabbed my attention. When I read it, I was simply working my way through the 15 other manga I had just purchased. Excel Saga was the most anticipated book of the bunch, and I read that first. Seeing as the remainder of my stack was essentially unknown to me, I read Basara merely when I got to it. That won't happen with the second volume, I can assure you. In this post-apocalyptic (isn't that an oxymoron?) world, the formerly great nations of earth have been reduced to tribal and feudal status following a great cataclysm. As power-hungry warlords try to claim more land of what was once Japan, helpless unincorporated villagers can do nothing but surrender to the brutal warriors or be slaughtered for resisting. Thus comes into play Yumi Tamura's handy definition of "Basara." She explains that a Basara is "a free but noble spirit who disavows established authority and rejects the restriction of convention." Such a soul is exactly what the troubled people of the future need. Twins Sasara and Tatara, children of a tribal lord, know that they are a special pair. Tatara is suspected of being the "child of destiny," the boy destined to lead his people to freedom. Sasara is...well, she actually isn't special. In fact, she feels as if she is as common as they come, and she would've lived her life completely unnoticed if she didn't happen to be Tatara's twin sister. However, when fate offers the two an unexpected and tragic twist, Sasara discovers she may be more special than she was raised to believe. The unfurling of the fast-paced story is filled with believable unpredictability and emotional ups and downs aplenty. You may not know where Tamura is taking you, but your destination will entrance you as will the ride to get there. As I said, I'm only into the first book and already quite a bit has happened, and the story has earned my rabid dedication. Fancy screen tones aren't employed as much as traditional shading, and while Tamura's illustrations capture details well, there's an impressionistic quality to her work that elevates the visuals beyond the look of a more realistically-penciled manga. By keeping some elements hazy, a reader's imagination is occasionally allowed to fill in certain scenes in the way that only a unique human mind can. This is gritty shojo, with the large, expressive eyes frequently appearing alongside depictions of the brutality of Basara's setting. Being a story of war, it has the potential to get rather messy, and the Older Teen rating is appropriate. Included in the work is a cute section from the author called "Tam Tam Time," where we learn how weird the author is (not that weird is bad!) and a heartfelt note from the editor of this edition. Another interesting addition to the release is a section recommending other titles readers may be interested in. While there are still a few pages devoted to promoting other books, there are three in particular (Vagabond, Chicago, and Banana Fish) that are treated to a lengthy description. Personally, I'd have to say that fans of Basara looking for more may want to check out my favorite post-apocalyptic work of all time - Battle Angel Alita. So now, among other things, I'm forced to suffer and wait not only for the newest Battle Angel, Love Hina, GTO, and Excel Saga, but for the next installment of Basara, as well. Good thing there are truckloads of other manga arriving weekly to keep me occupied.